Kale Hyder was an active teenager and basketball player when a mysterious polio-like illness struck. Outbreaks of AFM have grabbed headlines in recent years. The mysterious illness affects children’s nervous systems and typically causes severe weakness in the arms and legs. AFM is a subtype of transverse myelitis, the disease that struck Hyder. The surgery involves splicing small sections of healthy nerve into areas where AFM has destroyed the link between nerves and the muscles they coordinate, said Wolfe. He’s a senior researcher on the study and an orthopedic surgeon at the Hospital for Special Surgery. AFM cases have cropped up in the United States in every-other-year cycles since 2014, according to the U.S. Centers for Disease Control and Prevention. In 2018, there were 201 confirmed cases in 40 states, the most extensive wave to date. Experts suspect that viral infections might prompt AFM, but that hasn’t been confirmed. Nerve transfer surgery changed Hyder’s life. He had been experiencing some hand tingling and shoulder weakness, but shrugged it off. Hyder eventually regained the ability to move his arms around a little, but couldn’t lift his arms above his head. His hands didn’t work at all. Wolfe performed nerve transfers to each of Hyder’s arms, about 10 months after the teen first became ill. The delicate and painstaking surgeries are performed under a microscope and can take five to seven hours, not to mention hours of muscle and nerve testing beforehand to help plan the surgery. “It’s a world of difference,” Hyder said. “I’m able to extend my fingers so much better and grip a lot better than I was able to before.” He also can extend his arms over his head, allowing him to comb or wash his hair, or reach up into a cupboard. “I don’t think I would have been able to do that without the nerve transfer surgeries,” Hyder said. 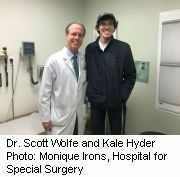 Even though Hyder did not have AFM, “surgeons can utilize nerve transfer procedures to restore function in patients who’ve experienced partial paralysis of a limb, whether caused by transverse myelitis or AFM,” Wolfe said. But Hausman, who wasn’t involved with the study, noted that most AFM patients spontaneously regain much of their motor function within a year after they are stricken. This clouds whether or not the nerve transfer surgery is actually helpful. “I don’t think we can say it works yet because it’s hard to tease out the effect of the nerve transfer from any degree of spontaneous recovery that might occur,” Hausman said.